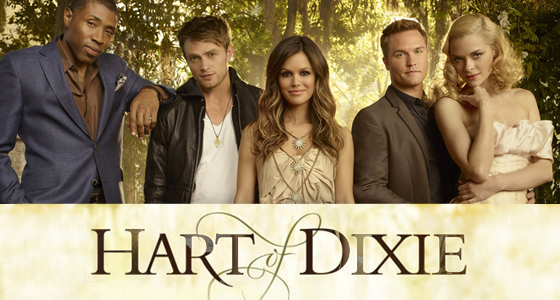 Which is my preface to this fact: I’m totally friggin’ obsessed with Hart of Dixie. Is it a fairly typical CW show? Yes. Is it just another variation on the tired fish-out-of-water storyline? Yes. Is it completely ridiculous and laughably inaccurate in how it portrays the American South (I assume. I haven’t been there myself to judge, but I’m still going to go with…)? Yes. Is the fashion both awesome and insane in a way that it actually makes sense that the show begins poking fun at its own characters’ fashion choices before the first season is even half over? SO MUCH YES. And yet! Is it also adorable, cheeky, charming, fairytale-esque, and chock full of appealing, good-looking people? Gosh, I don’t know, what do you think, shirtless-golden-lit-Wade-and-Lavon? There is just so much that’s appealing about the show that I can completely overlook the lack of believability — it’s practically besides the point in this portrait of Southern whimsy. But if you must have a plot, here it is: Rachel Bilson is Dr. Zoe Hart (like so many WB/CW shows, the characters have a tendency to call each other by their full names), a Manhattanite doctor who through some various shenanigans finds herself professionally exiled to Bluebell, Alabama, a place that exists off most maps and apparently almost forgotten by time. She has to deal with culture shock, a town that mostly doesn’t want her there, some daddy drama, the main Southern belle of the town immediately hating her, and (tough life) the presence of about a bajillion good-looking, charming Alabaman men. Bluebell is basically what small-town lovers fetishize, a Southern Stars Hollow, which is, of course, the bottom line of why I love Hart of Dixie so much — the story may be different, but it fills the Gilmore Girls-shaped hole that’s been in my heart for the last five years. So if you want to join me in my obsession and dip your toe in the Bluebell-ian water, the first season is available on Netflix streaming. And after you’re hooked, be sure to check out Go Fug Yourself’s recaps (four pages, so the first ones are on pg. 4), which feature roundups of each episode’s plot and insane outfits (or lack thereof!). PS Yes, there are two Friday Night Lights alum on this show. That should tell you something! And yet, they recently had a football-centric episode that featured neither of them on the field, boo.